Telecentre is a worldwide organization that provides access to various technologies and solutions for individuals and organizations around the globe, establishing development initiatives that these recipients can significantly benefit from. The organization is recognized globally and has received numerous awards for its initiatives, from content solutions to training and mentoring, to digital technologies. Telecentre is classified as a 501c(3) organization with a base on San Francisco, California established in 2005. The organization also has logistic offices in Manila, Philippines. Telecentre is an initiative of the International Development Research Centre of Canada, Swiss Agency for Development and Cooperation, and Microsoft Corporation. As a global organization, Telecentre is in charge of assembling a substantial number of similar organizations and other telecenters, partnering with other organizations to obtain the necessary beneficiaries. Over the years, Telecentre has accomplished numerous feats. It has been instrumental in the creation of telecenters in over 80 countries. As Telecentre fostered the development of training materials and workshops to further the success of telecenters worldwide, the Telecentre Academy was born. This initiative makes possible a unified education platform globally, assembling resources to be utilized by both individuals and organizations alike. Three of Telecentre’s most notable projects include SparkLab, TC Women, and TC Academy. SparkLab is an initiative that seeks to develop the full capabilities of both individuals and organizations through the innovative use of information and communication technology. TC Women, as the name of the initiative implies, aims to empower women from around the globe through ICT and other digital solutions coupled with the necessary information and professional training. This initiative helps women tap into progressive choices previously not available to them. 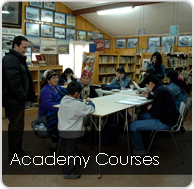 The TC Academy takes self-learning and education to the global level via an online learning platform. This initiative aims to provide effective, easy-to-learn, and innovative methods of learning with the help of a vast network of ICT gurus and mentors. Aside from trainings, the TC Academy provides custom learning programs and certifications for learners to become the driving force of change within their respective communities. Telecentre aims to bring the Web and the power of ICT to the world’s population, providing access to resources and tools that will give people, especially women, the opportunity to drastically improve their lives. As this initiative takes billions of resources to realize, Telecentre welcomes any support from benefactors and organizations to accomplish their mission and vision!